Chestnut brown colour, ruby hues show up in the light, minimal off white head. Smell is of dark malts, nutty, chocolate and roasted coffee with some sweet sugary notes. Taste is sweet caramel, malty, moderate bitterness, nutty, coffee, dark fruit like, nice roasted finish. Med-high carbonation, medium body, decent feel. Fairly tasty brew, a little one dimensional but still enjoyable stuff, perhaps a little on the sweet side. This isn't a bad beer, but it does lack some character and is a bit weak for a brown ale. It pours a dark ruby color that does let the light shine through when held up to light. It has a slightly tan head that hold up okay, some lacing as well. The aroma is nutty, malty, maybe some slightly roasted notes, but overall, there isn't much here. The taste is a bit on the bland side, some dryish notes, some caramel, some roasted nutty flavors, not much hop there, but it is present in the backbone. The beer could be more but it isn't making enough of a statement. It started out with some creaminess in the mouthfeel, but it dissipated quickly, and I'm getting more watery consistency throughout. There is also a rather unpleasant metallic taste to this beer towards the finish that is detracting from the taste as well. The beer is not all that carbonated, and would do well with more efforvescence. The finish and aftertaste are mild. 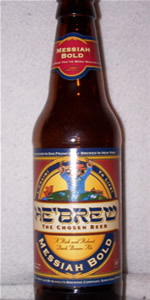 No L'Chaim on this beer, even though it is brewed by fellow Landsman. Re-review August 2009: Better I think than the first go round. More character, fuller body, nice and creamy, tasty, lots of caramel and sweet malts, maybe even a touch of cola syrup. Low on carbonation, not much head, retention, or lacing. I'll add a few points. Getting closer to the L'Chaim. Poured from a 12oz bottle into a standard glass. No freshness date provided. Appearance- 4 out of 5. "The Chosen Beer" is a very dark, translucent brown that borders on black. It pours with a two finger tan head that fizzes away within a minute to leave fairly thick sheets of lacing on the sides of the glass and atop the beer itself. Smell- 3 out of 5. There's not much going on in the nose. Of course, there are hints of roasted malt, brown bread, and a nutty scent, all of which are to be expected from a Brown Ale; however, nothing really stands out. For a beer that calls itself bold, it's a bit of a let-down. Taste- 4 out of 5. Aha! So the boldness wasn't merely an exaggeration after all. The taste makes up for what the smell lacks, with a dominant flavor of roasted barley backed up by black coffee and nuts. There is an undertone of caramel malt and a slightly chocolaty taste as well. As is common with brown ales, the hops are weak and hardly bitter at all, leaving more of a tingle than a bite. The aftertaste has a smokey character than mingles with hints of coffee. I like this beer's balance. It's bold without being bombastically brazen, like some heavier beers that mercilessly batter your mouth. It's like a slightly lighter, easier-to-drink Porter. Mouthfeel- 4 out of 5. Light to medium with moderate carbonation and a creamy texture. Drinkability- 4 out of 5. I would take this over a Newcastle any day. It has more depth without sacrificing drinkability. I doubt this beer would inspire another diaspora to the local liquor stores, but it's a solid brown ale that would be great as a gag gift for any Jewish friends or family members. You'd think for a (bold!) 'Son of God' the beer would sport some kind of halo (or at least a kippah to profess its faith in the matter). But no, it comes completely bare and was spared not even a shred to make lacing. Its plain, very dark brown body has no highlighting what so ever and shows about as much sign of coming to life as my chair or dresser. Just as there are no highlights in the appearance, there are no nuances in the aroma neither. There's a lot of toasty brown malt but that's...about...it. Usually it's easy to feign a hint of this or that, especially for an American brown ale style that is characteristically quite aromatic, but my nose has gotten tired of sniffing. It's just that plain. Which is a shame because the taste is really pleasant; that prevalent base of toasty brown malts is bestowed a little roast, a dash of cocoa and a generous amount of nutty flavour (pecan especially) and tons upon tons of smeared, squished fruits and dried fruits (including, in particular, figs, prunes and raisins). Those flavours relinquish little. The mouthfeel is about as well-stocked as a Communist-era Soviet grocery shelf; there is very little of anything and certainly nothing glitzy. Apart from the minimal amount of roast barely anything is perceived; even the fruity, sugary sweetness is short lived once the beer is swallowed. Despite its lightness on the palate it sits heavy in the belly. False alarm - He'Brew Messiah Bold is a good beer but it's far too pedestrian to be called a King of kings or Lord of lords. I personally would consider it no better than average for its style and near the bottom of the Shmaltz Brewing/He'Brew totem-pole. If shopping for "Chosen Beer" choose another of their offerings, like the fantastic Lenny's R.I.P.A. A: 2 finger off white head, nice lacing, dark, dark black - pours almost like a stout. S: Sweet, and dark chocolate. M: Full bodied, great carbonation. D: Easy. More like a porter though - classified as a brown ale? Overall a good beer, I'd like to see their other newer beers like the Lenny's RIPA. This pours a dark ruby color with a large tan foamy head. The smell has a real malt sweetness along with a "bisquity' aroma to it. The taste has a malty sweetness to it,but it's not very nutty. This has a somewhat watery m/f with a metalic aftertaste. The metalic aftertaste prevents you from tasting anything other than a small malt flavor. This is basically an average to below average beer. I wouldn't buy this again. dark brown hue with a medium tan head on the pour. Aroma and Taste is of sweet roasted caramel malt, some toffee presence with some slight cacao flavor, nuts and some light spiced hops. Palate is a medium bodied with a sweet sticky mouth feel. Finishes with sweet roasted caramel malt, a bit of nutty notes and some toffee and cacao flavor with some lightly spiced hops for balance. Overall a good, enjoyable and balanced brew, easy to drink. Another beer that seems to exist so a brewery, who makes good and interesting beers, can have a brand for the larger public. This is a beer that i would never buy again, Flavor is definitely a brown with nothing else; not intersting hops, aroma or mouthfeel. Poured from a bottle into a pint glass. A: Dark, when held to the light it appears to be a mahogany/cherry color. One finger brown head. Minimal to no lacing. S: Wow, a lot of malt right up front, dominates any other smell. Cherry, brown sugar, maybe some toffee. T: First sip I thought it was purely water. Almost no taste. As the beer warmed and I drank more, more flavors began to appear. Hints of cherry and chocolate. A little nutty. Not altogether pleasant, but not unpleasant. M: Too much carbonation and very thin and watery. D: Decent. It took me awhile to get through because I wasn't really enjoying it. I won't be seeking this out again. I bought purely for the novelty of it. I'm a senior theology major so the Messiah title immediately stood out to me, and I laughed out loud at the tagline, "The beer you've been waiting for." If this is the beer I've been waiting for, then I don't appreciate beer. Skip this one. This pours an uninspiring deep brown with a bit of promising, fluffy, tan head that dies away to nothing with no lace. On the nose there is a combination of nuttiness and toasted malt, really quite appealing. However there is a bit of the ester I got with Genesis ale the other night, which I'm not a fan of. In the mouth the nuts die away a bit and the esters come out a bit more, along with the toasted malt and some measure of sweetness. There is very little evidence of hop bitterness here, not necessarily a demerit, but worth noting. The body is medium thin with a medium finish, the toasted malt hanging around the longest. Overall, this is a better beer than Genesis to me, and something interesting, but when I want I nut brown I'll likely reach elsewhere. Pours a deep brown with a reddish hue. A nice one finger soft, foamy brownish head sits atop. The nose has notes of caramel malts and a faint nuttiness. The taste is rich roasted malts and caramel malts up front with some toasty, nutty undertones. There are some faint hops for balance. Mouthfeel is medium bodied, smooth, and well carbonated. Not a bad beer, but not one I'd seek out. Aroma Roasty malts,bread crust,a hint of dark fruit. Taste Rather decent dark beer but less robust than I anticipated (so far). I'm letting it warm more to see if it gets richer with more body or action. Well...it sweetened up a tad but is still a tad flat and watery. The flavor has that British hops finish,like Bell's Brown,kind of wooden. Otherwise the flavors are good but seem a tad weak. Mouth Where it falls apart. A Brown should NOT be "a bit watery" or a "bit flat"....and this is both. Hard for it to matchup vs Tumbler or Dark Horse Boffo,in particular. Odd...it's LOOK suggested it should have ample body and liveliness. Drinkability Okay, in that there's no nasty taste,but it's underwhelming. If I had a lot,It would go down okay,I doubt I revisit it. Bottle smell is of malt and caramel. Pours to a dark opaque brown. Tan head dissipates quikly. Upfront taste is semi-sweet dark chocolate, followed by a more bitter than sweet middle, and a dry finish. Carbonation is high for a sparly mouthfeel. Seems very rare for a beer with so much bold (hence the name?) flavor to finish so dryly and cleanly. A very refreshing brew. I would drink again in a heartbeat. Poured from 12 oz. bottle into He'Brew pint glass. Appearance: Very dark brown that shows some ruby red when held to light. Decent sized light tan head quickly fades into a thin white layer. Good lacing. Smell: Big scent of dark fruits up front followed by some caramel malts. A hint of coffee in the background. Not noticing any hops. Taste: Caramel malts and fruity sweetness up front. Finishes with a bit of coffee and chocolate with a slight amount of hop bitterness. Mouthfeel: Medium to light body with a medium carbonation. Creamy and smooth. Overall: A decent ale but different than what I typically expect from a brown. Pours a light brown into a pint glass. There is a bit of head which disappears quickly. Not an intense aroma. Sweet and malty, that's about it. It's quite tasty. Nice slightly toasty flavor with a little bit of hops. Somewhere between strong and light, although the name says bold, I wouldn't call it bold, but I like it. Quite easy to drink, this could be a sessionable brown, although most browns are sessionable. Poured a single from Woodman's in Madison ($1.25) into an imperial pint glass. Looked great coming out of the bottle, chestnut brown with an awesome ruby tone in there. Left about 1cm of bone colored head that dissipated quickly. Smelled decent, carmel, malt, sweet, nutty, and a little "foody" like a Christmas ale. Taste was pretty weak. Sweet kind of, and I guess carmel malty, but otherwise harsh and not strong enough. I can't put my finger on it, but something was out of balance and it just didn't rub me the right way. Average in the mouth. Medium body, good carbonation. It smelled kind of syrupy but it certainly didn't feel that way. Like most brown ales, it just plain lacks enough flavor and balance to be worth buying again. If I'm going to spend $7-9 for a six pack of brown ale, it's got to have lots of flavor and it's got to get me drunk. A beer could get all 5s for appearance, smell, mouthfeel, and drinkability, but if it doesn't taste good I don't bother. I wonder why some brewers "get it" with brown ales and others don't. Probably won't be trying this one again unless it's free.